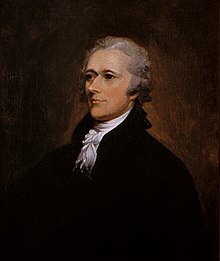 Alexander Hamilton (born January 11, 1755–died July 12, 1804) was a statesman, a political theorist and an economist. He was one of the Founding Fathers of the United States. Hamilton was the United States' first Secretary of the Treasury. He was known for the creation of a national bank. Born on the island of Nevis in the Caribbean, Hamilton moved to New York. When the American Revolutionary War started, Hamilton served in the Continental Army. He was a close aide to General George Washington. After leaving the military he started a bank. He was one of the framers of the United States Constitution. Along with James Madison and John Jay, he wrote the Federalist Papers, which supported the new Constitution. Hamilton became the Secretary of the Treasury under George Washington. He helped set up the United States' financial system. Hamilton supported a national bank as well as the funding of the national debt. A leader of the Federalist Party, he was a long time rival of Thomas Jefferson. He was killed in a duel with political rival Aaron Burr in 1804. Today, Hamilton is usually thought of as one of the most important of the early leaders. Hamilton's portrait appears on the United States ten-dollar bill. Hamilton was not born in the United States. He was from the Caribbean island of Nevis. His father was James Hamilton and his mother was Rachel Fawcett Lavien. Hamilton's mother had a child from a previous marriage that she left behind when she moved to Nevis. At the time, she was still married to another man. This meant that Hamilton was illegitimate. He was very sensitive about this fact. His father had left him as a child. Two years after this tragedy both Hamilton and his mother became sick. Hamilton recovered, but unfortunately his mother died. He was grief-stricken and moved in with his cousin. His cousin committed suicide. In 1772 Hamilton went to New York to continue his education. He attended Kings College, now called Columbia University, until 1776. In 1800 Hamilton's political rival Thomas Jefferson beat the Federalist John Adams. Jefferson and Hamilton had very different ideas about the direction the new country should take, although both were important founding fathers. Hamilton was the founder of the United States Revenue Cutter Service, which in 1915 became the United States Coast Guard. For that reason, he is considered the father of the United States Coast Guard. He was a staunch constitutionalist who, unlike several of the founding fathers, believed in a strong central government. During his life he was involved in nearly every major political event from the Revolution to the election of 1800. His writings fill a staggering 27 volumes. Yet he is probably the least well understood of any of the founding fathers. By the time of Hamilton's death, the Federalist Party he had helped start was in decline. Hamilton and the Federalists had convinced Washington to create a central bank, assume the debts of the states and pass tax laws. There is little doubt these moves helped save the new democracy. Hamilton is the subject of the 2015 Broadway Musical, Hamilton. It was written by and stars Lin-Manuel Miranda in the title role. ↑ 1.0 1.1 1.2 1.3 "Federalist Papers". History. A&E Television Networks, LLC. Retrieved 7 October 2016. ↑ "Alexander Hamilton (1789 - 1795)". U.S. Department of the Treasury. Retrieved 7 October 2016. ↑ 3.0 3.1 3.2 "Duel At Dawn, 1804". Eyewitness to History.com. Retrieved 8 September 2016. ↑ "Weehawken Dueling Grounds". Atlas Obscura. Retrieved 8 September 2016. ↑ The other non-president honored on US money is Benjamin Franklin. ↑ GoodReads.com, "Alexander Hamilton Quotes"; retrieved 2012-10-9. ↑ 9.0 9.1 Katie Braynard (March 3, 2016). "The Long Blue Line: Alexander Hamilton – first member of the long blue line". Coast Guard Compass. United States Coast Guard, U.S. Department of Homeland Security. Retrieved 23 October 2016. ↑ Michael Federici. "The Legacy of Alexander Hamilton". The Imaginative Conservative. Retrieved 23 October 2016. ↑ 12.0 12.1 12.2 "The Federalist Party". The American Experience. PBS; WGBH. Retrieved 24 October 2016. ↑ Kelly Lawler (December 25, 2016). "USA TODAY Entertainer of the Year runner up: Lin-Manuel Miranda". Retrieved December 25, 2016. This page was last changed on 16 April 2019, at 13:22.